The Girl Scout Shop will be closed Saturday, April 20th for Easter. Welcome to Girl Scouts! Your girl will have a great experience meeting new friends, exploring the outdoors and learning new skills, all in a girl-led and nurturing environment. 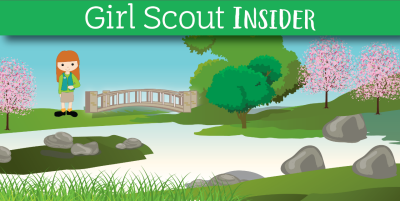 Click here to follow Flat Daisy to our new parent information Girl Scout Insider page. Here you'll find new information to help guide you through your first year as a Girl Scout parent as well as upcoming opportunities for your Girl Scout! We want to extend a congratulations to Troop 11012 for being the winners of this year's Bling Your Booth activity! Thank you to all of this year's applicants for all of your work and creativity this cookie booth season! Take a look at all the amazing cookie booths below. Girl Scouts Nation's Capital held it's 57th Anuual Meeting last weekend. Over 800 people were present. Read meeting remarks and view highlights below.